NEW YORK, New York, April 18, 2013 (ENS) – Desalination plants are typically built in dry places. But along New York’s Hudson River a different story is unfolding. A desalination plant has been proposed by United Water New York, a private company, to address the rapid growth of water demand in the expanding New York City suburb of Rockland County. If built, the Haverstraw Water Supply Project on the Hudson River’s Haverstraw Bay would mark New York State’s first foray into desalination, the process of removing salt and particulates from water to make it potable. But the region receives a lot of precipitation and, as many residents learned when Superstorm Sandy hit late last year, the area is also prone to flooding. Sandy sent a six-foot storm surge up the Hudson River estuary to Troy, New York, 125 miles upriver from Haverstraw. The water intake structure for the desalination plant would be located in Haverstraw Bay about 40 miles north of Manhattan. 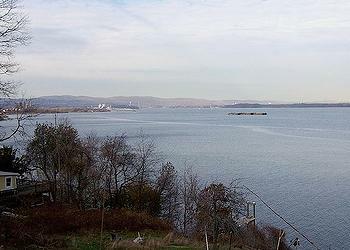 Although there has long been an industrial presence in Haverstraw Bay, it still serves as a nursery, spawning area and wintering ground for many species. It was designated a Significant Coastal Fish and Wildlife Habitat in 1987. But Entergy’s nuclear power plant, the Indian Point Energy Center on the river in the town of Buchanan, is just 3.5 miles from the desalination plant site, too close for comfort say many residents. “I am horrified by the prospect of drinking Hudson River water,” said Rita Louie, deputy mayor of the Village of Pomona, a community of 3,000 that straddles the Rockland County towns of Haverstraw and Ramapo. Rockland residents’ concerns about Indian Point are justified, said Paul Gallay, president of Riverkeeper, an organization that advocates for the health of the Hudson River and its tributaries. The aging nuclear plant sits on two active earthquake faults. In the event of an accident that releases radiation, the desalination plant could be removing salt from contaminated water, although United Water New York says it would be shut down if such an accident occurs. Even without an accident, Indian Point is permitted by the U.S. Nuclear Regulatory Commission to release into the river small amounts of radioactive chemicals, including tritium and strontium-90. Reverse osmosis water treatment processes, including the one that United Water plans for its desalination plant, do not remove all traces of strontium-90 from the water, says Hayley Carlock, an environmental advocacy attorney for the nonprofit Scenic Hudson in nearby Poughkeepsie, New York. This is important because the strontium-90 found in the Hudson River comes from Indian Point, Carlock said. Traces of strontium-90 and tritium were detected in the desalination plant’s pilot project, she said. The levels found in during the pilot plant’s 18-month run were nowhere near the maximum contamination levels, MCLs, set by the U.S. Environmental Protection Agency for tap water. When it set maximum contamination levels for all radionuclides, the EPA assumed that a person’s water consumption would be two liters a day, 365 days a year for a lifetime of 70 years. If a person consumed water at the tritium MCL (20,000 pCi/l), at a rate of two liters per day for 365 days a year over an entire lifetime, that person would increase his or her chance of cancer by about four chances in a million per year. Although the chemistry of strontium-90 is different, its risk profile is the same. Carlock says the possible consequences of tritium and strontium-90 contamination are great enough to make her want to avoid the risk. “It’s scary. What if Indian Point leaks, and it isn’t detected right away and the desalination plant is not shut down in time?” Carlock said. If the New York State Department of Environmental Conservation approves United Water New York’s desalination plant proposal, it would have to re-classify the stretch of the Hudson River at Haverstraw Bay as drinking water, and it would have to require stricter guidelines on the discharge of contaminants, Carlock said. United Water New York says on its website that the water produced in its pilot desalination plant in Haverstraw Bay is of the same or higher quality than drinking water currently consumed by Rockland County residents. Other towns and cities already treat Hudson River water to safe drinking standards, the website notes. But those towns and cities – Poughkeepsie, Wappinger’s Falls and Rhinebeck – do not need a desalination plant because they are located north of the Hudson River’s salt front, Carlock said. 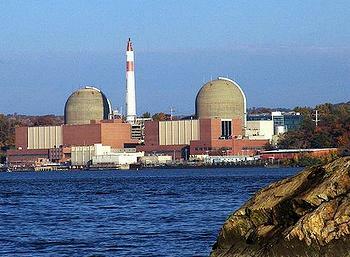 They are at lower risk of radiation contamination as all are located between 25 and 50 miles north of Indian Point. As Hudson River water has no saline content at Poughkeepsie, for example, turning Hudson River water into drinking water there would use only about a third of the energy it would take to produce the same amount of water at the Rockland plant, she said. The Hudson is a tidal river that tends to flow south more than north. If any Indian Point contaminants make it up to Poughkeepsie, Wappinger’s Falls and Rhinebeck, their distance from Indian Point means that the contaminated water would be very diluted, Carlock notes. The EPA-ordered dredging of the Hudson River now underway about 170 miles north of Haverstraw, near Fort Edward, New York, also concerns Rockland residents. The EPA and General Electric started dredging tons of PCB-contaminated sludge from the Hudson River in May 2009. Between 1947 and 1977, GE dumped an about 1.3 million pounds of PCBs into the Hudson River. The Department of Environmental Conservation’s final environmental impact study, which determines whether the desalination plant proposal can go through to the permits stage, is expected soon. It is meant to address concerns raised during the public comment period. Water scarcity is a legitimate concern. 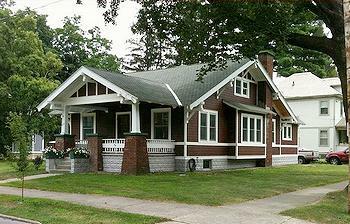 The Rockland County town of Ramapo is expected to grow another 35 percent between 2010 and 2030. In total, Rockland county’s five towns: Ramapo, Orangetown, Stony Point, Haverstraw and Clarkstown, are expected to grow 18 percent over the same period. “Based on recent evidence, it appears that our towns are not ready to stop growing,” Rockland’s hydrologist, Dr. Daniel Miller said. In 2006, Miller predicted a future water shortage for Rockland County. United Water New York’s regulator, the New York Public Service Commission, reacted to this assessment by ordering the company to build and operate a long-term major water supply project that could meet the county’s water needs beyond 2015. If the desalination plant proposal goes forward, Rockland County will need a lot more electricity. The desalination plant “will forever tie Rockland County’s water rates to [fluctuating] electricity prices,” Carlock said. United Water New York’s Deb Rizzi counters by pointing out that the water in Haverstraw Bay has one-tenth the salinity of ocean water, so the Haverstraw desalination plant will be less energy intensive than one that purifies seawater. In addition, the cost-sharing agreement between United Water New York and United Water New Jersey for the operation of Rockland County’s Lake DeForest reservoir expires this year. “The issues are monumental. They cannot be solved by Rockland County alone. We are talking about horrendous flooding and of supplying water from New York to New Jersey,” said Harriet Cornell, chairwoman of the Rockland County Legislature. “United Water New York and United Water New Jersey are regulated by the states. Governor Cuomo should invest these issues with the importance they deserve,” said Cornell. Simon Gruber, an independent planning consultant and fellow of the City University of New York’s Institute for Sustainable Cities, said that building a desalination facility on the Hudson River would create a less sustainable model for New York for the future. “We can resort to heroic and very expensive engineering project to try and push the envelope, and the desalination plant may be an example of this, but at some point we need to recognize these limits,” said Gruber. Nevertheless, United Water New York wants to start building its $189.3 million Haverstraw Bay desalination plant this year and have it up and running by 2015.